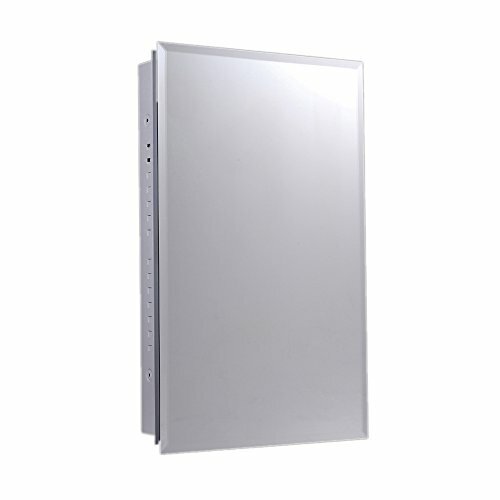 Ketcham Cabinets Euroline Series Recessed Slim Style Medicine Cabinet Polished Edge Mirror 18"X36"
Euroline series slim style medicine cabinet. Flush mounted, single door medicine cabinet. Removable 1/4" bulb edge glass shelves. Ferrari style cabinet hinges. Designed for tandem mounting. Aluminum shelf clips. Ketcham provides one year warranty. Overall Size: 18"Wx 36"H, Wall Opening: 16 7/8" Wx 34.25" xH 3.25"xD, Shelves: 4. Mirror Type: Polished Edge Mirror. Mount Options: Recessed. Product Care: At Ketcham we want your Ketcham Medicine Cabinet to be with you a long time and maintain the same beauty and functionality as the day it was installed. Following these cleaning instructions and using the approved cleaning solutions will keep your Ketcham Medicine Cabinet bright and beautiful throughout it's life. The following cleaning solutions are recommended to clean your medicine cabinet mirror. Apply the solution to a soft clean microfiber cloth first this will prevent spillover onto the mirror edges or back of the mirror. This will prevent premature medicine cabinet mirror corrosion. Acceptable Cleaning Solutions: Vinegar-water solutions (less than 5% vinegar). Ammonia-water solutions (less than 5% ammonia based). This solution is only to be used if they do not contain ANY alkali, as this will cause mirror spoilage. Alcohol based solutions (less than 5% ethyl, methyl or rubbing alcohol solution. DO NOT clean your medicine cabinet mirror with any knives, scrapers, emery cloth, scouring sponges or any abrasive materials. DO NOT use alkali or acid cleaning solutions, as this will severely damage the medicine cabinet mirror. Ketcham Cabinets Surface Mounted Space Saving Corner Cabinet Polished Edge Mirror 14"X36"